After a wonderful breakfast (yet, sadly, without bacon) in the hotel, I left to go sight-see. I first caught the Sky Train down to the River Ferry. The River Ferry is like a bus on water. 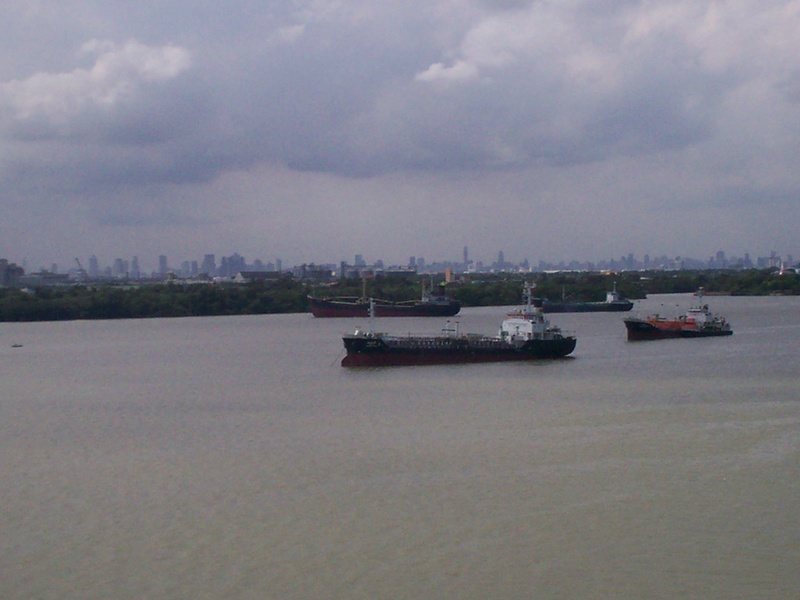 It has several stations all up and down both sides of the river, and you pay based on the distance you're going. Of course, you're not paying that much, since Thailand is incredibly cheap. In fact, I think you get more for your money there than in Egypt. But that is neither here nor there. 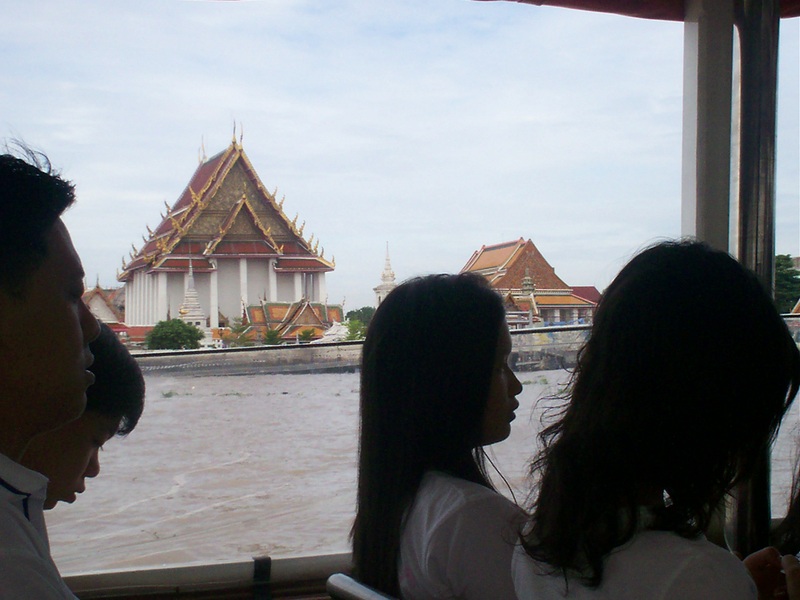 I hopped on the River Ferry and got off at the station for Wat Pho and the Grand Palace. 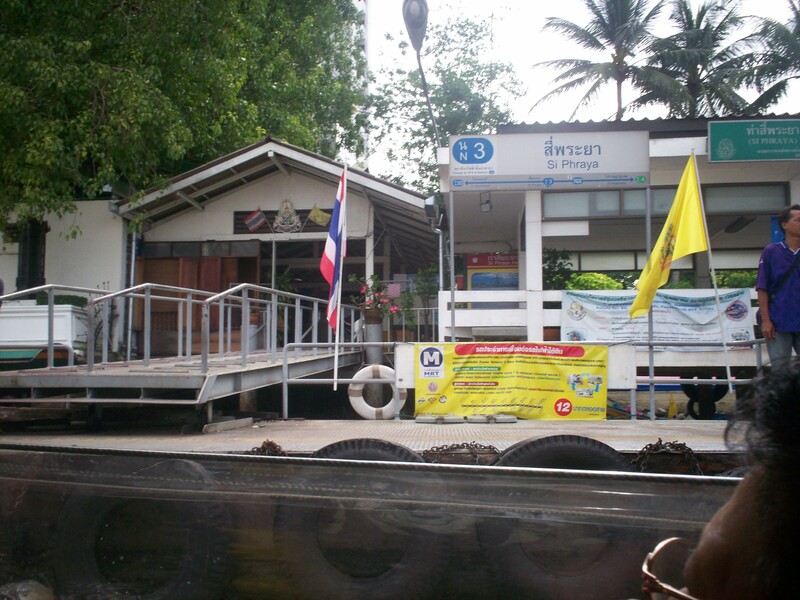 When I got off the boat, I walked across the street from the station and entered the Wat Pho complex. This complex contains several Buddhist structures, and is also famous both for containing the largest Reclining Buddha in Thailand as well as the highest number of Buddha images in Thailand. And the complex itself is pretty big--20 acres. When I entered the grounds, I was struck by how ornate and beautiful everything was. Everything was done in such detail, and done well. Also, unlike most Egyptian tourist attractions (and many American ones), there wasn't trash all over the ground everywhere. 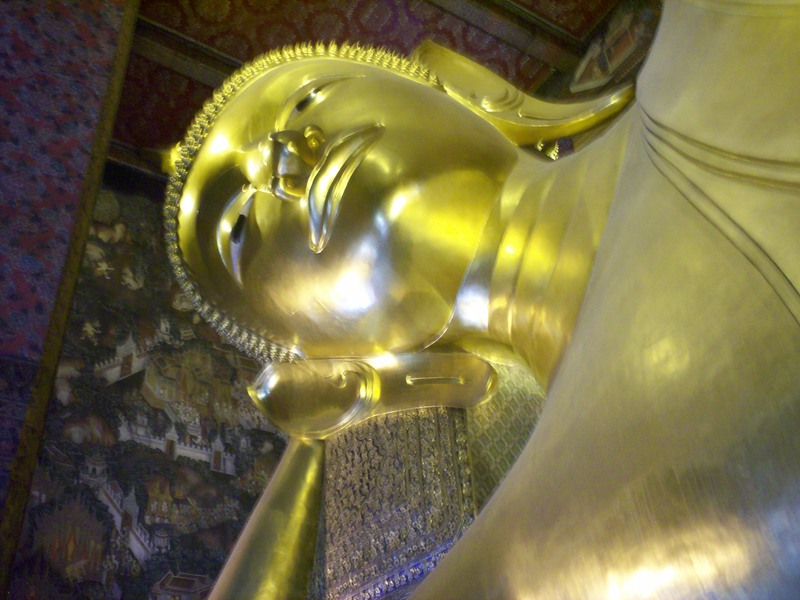 Now, about that Reclining Buddha--that is one big statue. When you enter the building where he is, his head is right there on the left. I was so overwhelmed by how big it was that I actually did a double-take! And when I say "big," here are this Buddha's stats: 46 meters long and 15 meters high. (For those of you who think in feet, that's about 150 feet long and 50 feet high.) The statue is gold-plated, and the soles of his feet are engraved with mother-of-pearl decoration showing the 108 (any Lost fans out there?) auspicious characteristics of the Buddha. After seeing Wat Pho, which at that point was probably one of the most beautiful non-natural places I'd ever seen, I was so impressed that I was sure it coudn't get any better than that. I could not have been more wrong, because the next place I went was the Grand Palace Complex. There are simply no words to describe the ornate beauty of that place, so I will just say that it was stunningly, unbelievably, overwhelmingly lovely. There were audible "oohs" and "ahs" from everyone as we passed through the main entrance--stepping into an ornate, colorful, bejeweled world that is so perfect you would think Walt Disney had created it. I mean, the buildings literally gleamed and glistened in the sun, with the gold and jewels taking on different hues and different levels of brightness with every different viewing angle. I spent so long there gawking at all the buildings with all their intricate details that I was almost late meeting my taxi to the cruise ship! And I didn't even get through the whole complex! Not knowing what a special place this was, I had only allotted myself two hours there. BIG MISTAKE--I could easily have spent all day. 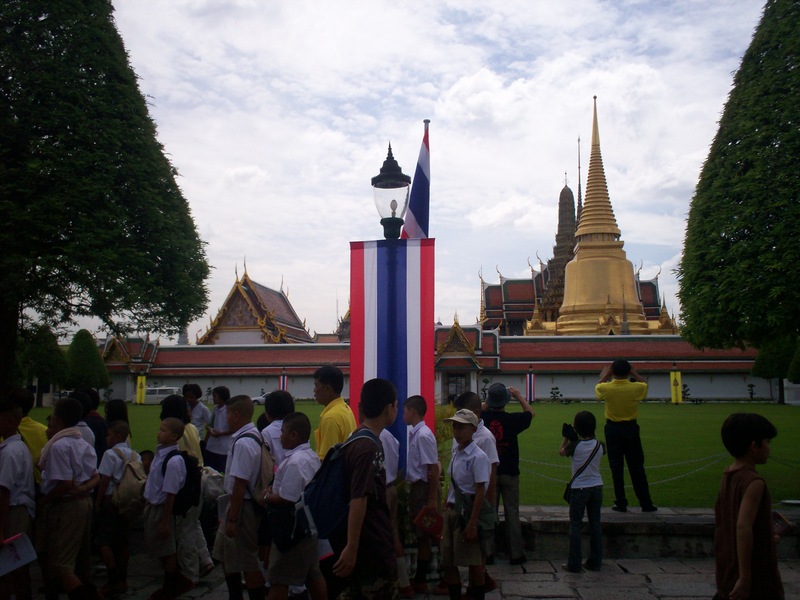 The Grand Palace Complex was established in 1782 and contains the royal residence along with several other structures. From what I understand, the king no longer lives in this palace, but certain ceremonies are still held here. 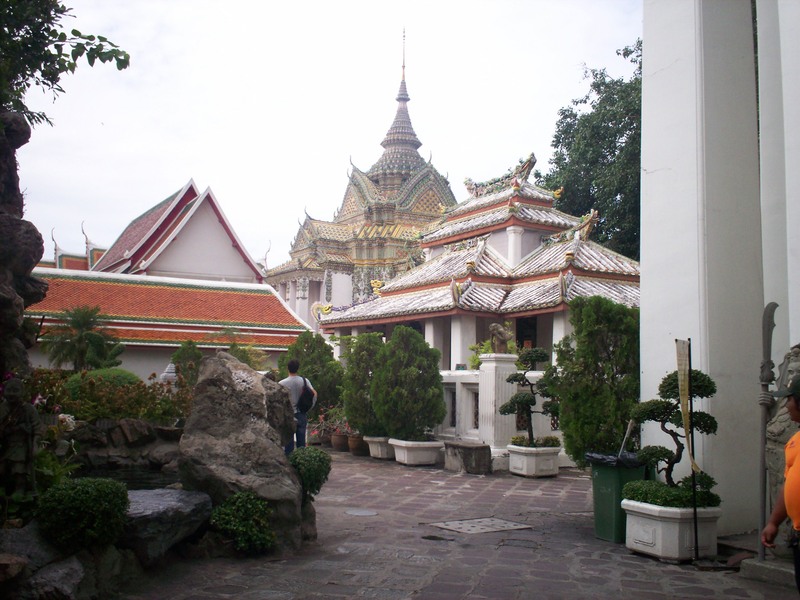 The complex also contains several Buddhist temples. 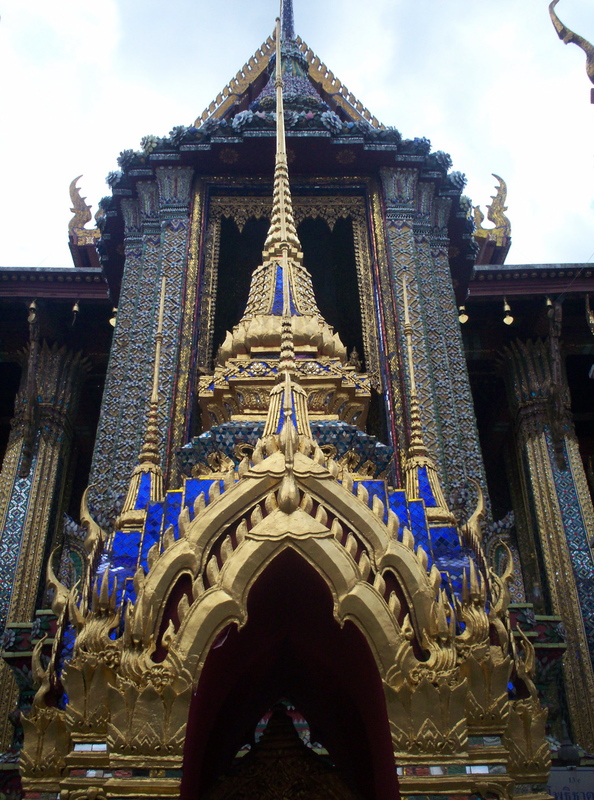 One temple houses the highly-revered Emerald Buddha (who is actually made of jade). This particular Buddha statue is considered so holy that no one is allowed to take pictures of it. And when the Thais say no pictures, they mean it. It's not the wink-wink nudge-nudge kind of a policy like it is in Egypt. The Thais actually have people watching all the tourists, and if they suspect anyone of having taken a picture, they will look through all the pictures on your digital camera to make sure there are no prohibited pictures on there. I don't know what they do for people with film cameras, but I wouldn't want to find out the hard way! I made my way up to my room, which was the nicest place I'd stayed in since the Zambezi Sun (the nice hotel near Victoria Falls). I made easy friends with my cabin steward, in part because I could pronounce her name. It was Moicza (pronounced "Moytza") and she was from Slovakia. She was such a lovely person and we always looked forward to seeing each other every day. 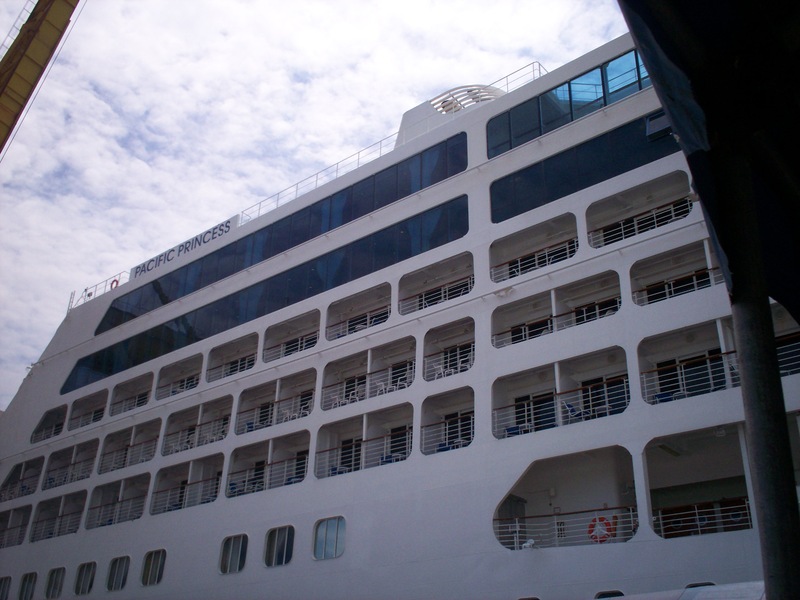 After exploring the ship and grabbing some free food (hey, that's what cruising's all about, right? ), I relaxed in my room and turned on the TV for a bit to catch some news. It was nice to have a TV again, if only for 17 days and with a limited number of channels. Well, when I turned on CNN, what city do you think they were talking about? That's right--Bangkok! That was the day that they arrested the man who confessed to Jon Benet Ramsey's murder. (He later turned out NOT to be the murderer, of course.) I tell you, the news just follows me! Stay tuned for Day 3. It's a Sea Day, so the pictures will just be of the boat and my wonderful dinner tablemates, but it's still good stuff.